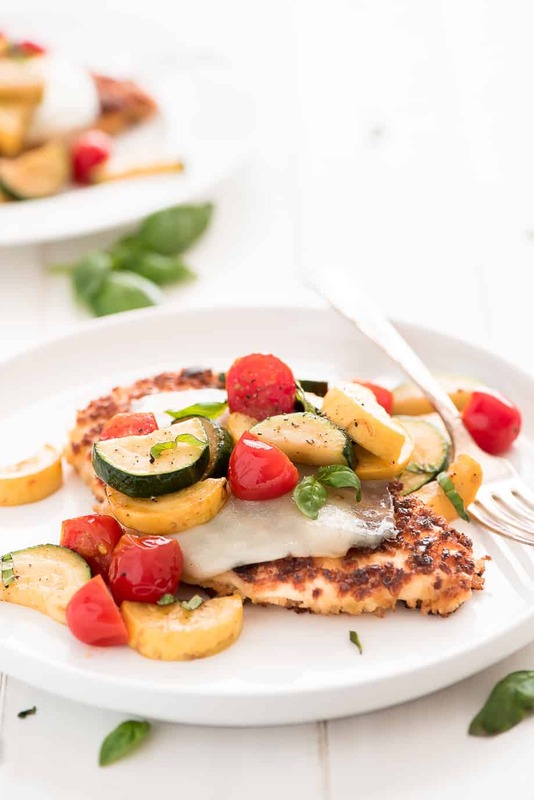 This 20-minute Summer Chicken Parmesan has that classic delicious crispy coating but instead of smothering it in red sauce it’s topped with your favorite summer veggies and ribbons of fresh basil. Hey friends! Melanie here again from Garnish & Glaze. 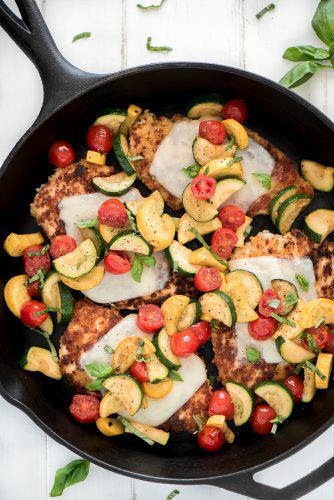 I love a good classic recipe but sometimes it fun to put a twist on them like I did with this delicious Summer Chicken Parmesan. Don’t worry, it still has that same great crispy coating but loaded up with lots of fresh veggies giving the meal more color and texture. 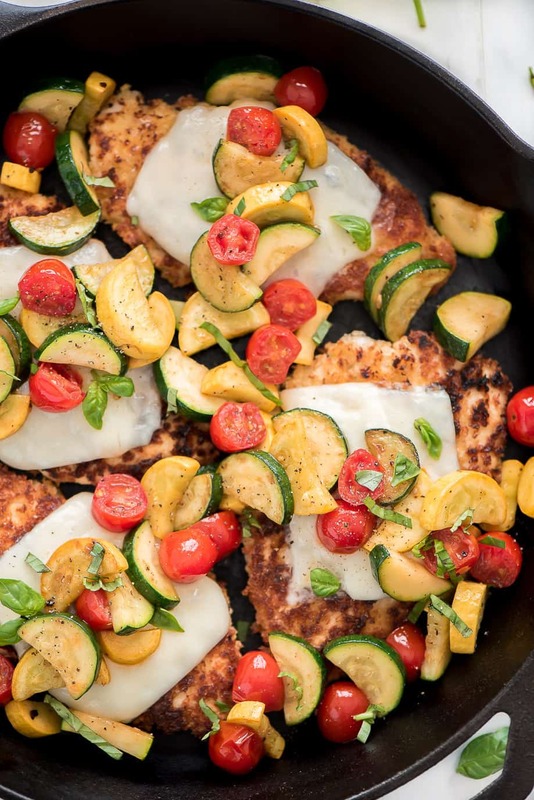 How do you Make Summer Chicken Parmesan? The first step is to get everything set up for breading the chicken. You’ll need three shallow bowls- one for the flour, egg, and bread crumbs/Parmesan. Each thinly sliced chicken breast then gets dredged in the flour, the egg, and then coated in the Panko/bread crumbs. I like to always use Panko bread crumbs versus traditional because it lends to a crispier texture. Once the chicken is coated you’ll cook it for 2 minutes on each side until it is golden brown. You’ll place them on a baking sheet, top them with cheese and pop them in the oven so the cheese can melt. 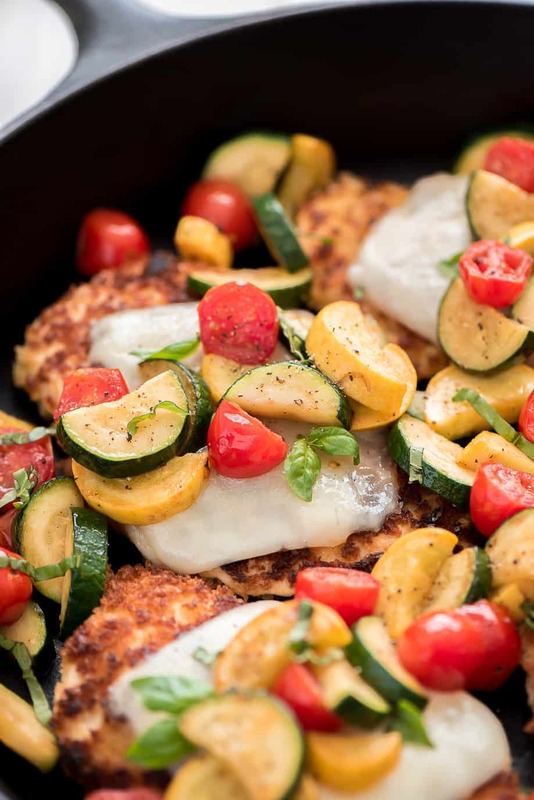 Before throwing the skillet in the sink you’ll toss in the zucchini, summer squash, and tomatoes with a little garlic and cook them until they are crisp tender. Throw the veggies over the top, sprinkle on some fresh basil and enjoy! This meal comes together so quickly (just twenty minutes!) making it a perfect weeknight meal for those warm spring and summer days. Serve it with a side salad, garlic bread, or even some butter noodles to make it a complete meal. Preheat oven to broil and spray a baking sheet with oil. In a shallow bowl combine bread crumbs and Parmesan cheese. Place flour in another shallow bowl and the beaten egg in another. Season both sides of chicken breasts with salt and pepper. Dredge the chicken in flour, egg, and then bread crumbs. Heat 3 teaspoons oil in a large skillet over medium heat. Add breaded chicken (you may need to work in batches if you pan isn't big enough). Cook on each side for about 2 minutes until golden. Move chicken to baking sheet, top with mozzarella cheese and place in the oven for 1 minute until cheese melts. In the same skillet used for the chicken, add 1 teaspoon oil. Add the zucchini and squash and cook for a minute. Add the tomatoes and garlic and cook another 3 minutes or until vegetables are crisp tender. Serve over the chicken and sprinkle with fresh basil.